Trainees perform a drill during graduation ceremony in Tripoli, Libya, on Feb. 13, 2018. Picture by Hamza Turkia/Xinhua News Agency/PA Images. All rights reserved.Seven years after the Arab uprisings, Libya’s deinstitutionalization of the established order is far from being a success story. In 2011, the ‘Arab Spring’ events were a surprise to the EU, its member states and western organizations. With the outbreak of the protests, the EU was forced to face the challenges of reconfiguring its own action beyond its border and the need to acknowledge each country’s unique domestic political situation, of which Libya is a very illuminating example. Today, the Libyan crisis is still unfolding, and its outcome is utterly uncertain. The Libyan turmoil upsurged in a country where the EU-Libya relations were virtually nonexistent from 1992 to 1999 and were relaunched only in the late 2000s. In actuality, the Libyan crisis opened a pandora’s box made up of a twisted political scenario imbued with 42 years of authoritarian and uninterrupted personalistic grip on power, upon which the EU wishes to react and elaborate its common security and foreign policy. The weight of EU commitment to Libya’s political stabilization and security compared to the persistent conflict that thwarts long-term solutions calls for a more in-depth unpacking of the intention-implementation gap and the implementation-local reception gap between on paper and actual outcomes. This is what my co-authors and I have attempted to do in a recent working paper titled “The implementation of EU Crisis Response in Libya: Bridging theory and practice”. The study focuses on how the EU substantiates its crisis response in Libya, analysing the implementation phase and practitioners’ as well as local actors' perception that connects decision-makers in Brussels to final beneficiaries in Libya. The investigation is part of the HORIZON2020 research program called EUNPACK, which analyses EU crisis response in a number of countries including Libya, and it investigates two main gaps in the EU intervention. The international debate accompanying the EU action in Libya; the anxieties of European audiences vis-à-vis perceived threats of migration and terrorism originating in Libya; and the expectations of EU member states are all indications that the stakes are higher than crisis response alone when it comes to Libya, and these dynamics may have sensible implications on the overall EU action in the country. As a consequence, top-down understandings of policy design must be corroborated by bottom-up investigation of how the EU crisis response is received and perceived by different local actors throughout the conflict cycle, by focusing on practitioners connecting security practices to beneficiaries. The Libyan revolts in February 2011 caused a violent reaction by Gaddafi’s regime and prompted the UN Security Council to intervene. By expecting to overthrow Gaddafi in a matter of weeks, UNSC adopted the resolution 1973 establishing a no-fly zone and, in the name of R2P, it authorized member states to end violence against, and abuses of, civilians. EU’s intervention followed the UN but slowly and incoherently. The EU adopted a panoply of crisis management instruments including diplomatic measures, humanitarian assistance, military and civilian operations. Libya never joined the EU Barcelona process and never signed any Association Agreement but negotiations on the EU-Libya framework agreement were eventually re-launched in November 2008. In 2009, the Commission issued a Libya Strategy Paper and National Indicative Programme 2011-2013. The country strategy paper (CSP) envisaged a few priority areas of common interest to be covered in the framework agreement, including fighting illegal immigration in the Mediterranean or terrorism, supporting the country’s hydrocarbons energy resources, creating the bases for successful investment in new sectors and eventually human rights. The negotiations stalled and stopped when political turmoil flared up in early 2011. Between 2011 and 2014 EU policies towards Libya focused less on a crisis response and more on the role of the international community to accompany legitimate Libyan authorities in post-crisis recovery and institution-building. In 2014, the partition of the country in at least two opposing camps and the spreading insecurity across the country forced the EU to refocus on crisis definition and response, as well as to relocate international actors including EU delegation. Our research reveals that the overall framework of Europe’s approach to the Libyan crisis has remained fundamentally unchanged since the 2014 recognition of the security crisis unfolding in Libya. Confirming the key orientations of the Political Framework for a Crisis Approach of 2014, the European Council concluded that “there is no solution to the Libyan crisis through the use of force” and reiterated support to the institutions built by Libyan Political Agreement (i.e., Presidency Council and Government of National Accord led by Prime Minister Fayez Sarraj). In practice, however, the analysis suggests that short-term objectives have often taken precedence over the stated strategic goal. EU leaders have sought quick-fix solutions to offer immediate answers to the anxieties of their constituents, who allegedly perceive growing migrant flows from Libya as an existential threat. Debates held during the electoral campaigns in a number of key European member states have illustrated how proposed crisis management measures primarily aimed to do as little damage as possible to election results. In other words, as migration became securitized and framed as an emergency, EU leaders appeared to address the needs of European audiences more than those of local stakeholders and vulnerable groups. One could argue that the mismatch between the grandiloquent declarations and the action implemented on the ground is the result of internalizing foreign issues for domestic political purposes. Our findings show a troubling lack of monitoring and impact evaluation schemes across most of the EU crisis response initiatives in Libya. This grants weight to those who fuel the suspicion that crisis response initiatives are designed not to bear any meaningful consequence in practice. The decoupling of rhetoric and practice, however, can lead to EU external action and crisis response being perceived as no more than a rhetorical wish-list than seriously considered policy options. The gap between ambitious objectives and aspirations on the one hand, and the capacity or willingness to achieve them on the other emerges in different areas of EU response policies in Libya, generating distorted expectations among beneficiaries, local counterparts, and European audiences. The EU set a broader engagement with the different dimensions of the Libyan crisis, thereby signaling a deeper and more comprehensive understanding of its security implications; however, while deploying a great diplomatic effort with both local and international actors, in practice the EU approached the crisis in Libya as border enforcement and control. This strategy was underpinned by a narrative in which migratory flows across Libya became increasingly complicated through the Islamic State gaining terrain in Libya late in 2014. The migration question captured much of the agenda on the European member states and it was increasingly portrayed as a threat. The EU started to address the migratory flows to Europe through a purely securitarian approach, designing a securitization of migration that contributed to swiftly reframing the Libyan crisis into essentially a migration crisis. The 2017 Strategic Review of EU CSDP-missions in Libya, including EUNAVFOR MED, stressed that the political framework of EU future engagement in Libya needed to build on the Joint Communication on the Central Mediterranean of 25 January 2017 and on the Malta Declaration of 3 February 2017. This specification amounts to emphasizing the continued centrality of migration among EU security concerns. The securitization of migration, and the framing of the latter as a crisis with destabilizing potential have led to the EU’s normative commitments being overlooked, if not abandoned, in spite of their relevance precisely in times of crisis. Such a patent intention-implementation gap has prompted the censure of a broad set of actors, from human rights organizations to UN agencies, which theoretically share the EU’s same normative standpoint and could, therefore, represent natural allies in times of crisis. Moreover, the lack of authorisation to operate inside Libyan waters has made the fulfillment of the missions’ original mandates particularly problematic. The recognition of this impasse highlighted the need to strengthen local partnerships with Libyan stakeholders. This happened for instance for EUNAVFOR MED’s tasks, for which the training of the Libyan coastguard became one of its most prominent activities of 2017. 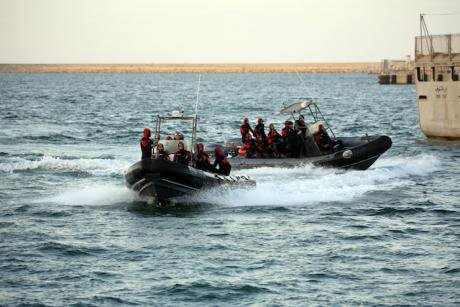 However, the monitoring of progress and the evaluation of the impact of training modules tailored to the Libyan coastguard has proved particularly controversial. International experts’ reports about the alleged misconduct of Libyan coastguard officers – among which beneficiaries of EU-sponsored training are to be found – have raised doubts about the effectiveness and sustainability of this strategy as the most thorny issues. In the absence of more all-encompassing security sector reform (SSR) and thorough vetting procedures, short-sighted security responses may well lead to the unwarranted legitimization, co-option, and institutionalization of highly controversial security actors. In practice, Libya displays a quintessential case of hybrid security governance, in which the state is forced to share authority, legitimacy, and capacity with other structures to provide security, welfare and representation. The civilian CSDP-mission EUBAM Libya (EU Integrated Border Management Assistance Mission) focuses on Security sector reform (SSR) advice and planning but as officers confirm, efforts at SSR and DDR have suffered from the lack of an integrated and over-arching institutional framework, as these were “only progressing in an ad-hoc manner”. The EU framework for CSDP missions as outlined by “Elements for an EU-wide strategic framework to support security sector reform” does not rule out non-state actors: the document fosters inclusive societal participation across all relevant stakeholders including, most notably, non-state security actors, guerrilla movements, informal providers of security, etc. On the contrary, EUBAM’s mandate forces the mission to deal with Government of National Accord (GNA) representatives as the sole internationally recognized authority responsible for security sector reform. These developments could lead to a serious gap in the humanitarian response to this crisis. Controversy about the abuses perpetrated on migrants and asylum-seekers in Libyan detention centers offers a clear illustration of this. Through the externalization of border controls, the EU has indirectly promoted the massive resort to unsafe detention schemes for the management of irregular migration in Libya, prompting allegations that the EU crisis response brought about a “policy-made humanitarian crisis”. Moreover, international organizations and staff still work by remote management – brought about by security concerns and strict EU regulations – which is far from ideal in terms of monitoring, evaluation, and accountability. Apart from daily visits to a limited area in Tripoli, EU staff are prevented from accessing Libya and the main areas where EU-funded projects are carried out. Similar constraints apply to other Tunis-based humanitarian actors, who are skeptical about the accuracy of their own and external needs assessment and claim that independent oversight is limited by stricter security regulations. The opinion is well summarized in the idea that “We are all in the same fog, no one has a real understanding of what happens on the ground”. At the same time, INGOs perceive to have little room to influence and renegotiate EUTF strategies, and that, due to rigid bureaucracy, their interventions risk being more politically-driven than needs-driven, with a slightly uncontrolled flow of money disbursed for the sake of EU single MSs stability and constituencies’ satisfaction. In conclusion, our study not only confirms that EU-sponsored crises response programmes in Libya are often subject to high politicization and pressure from Brussels, it also highlights how by securitizing migration, EU leaders have appeared to address the needs of European audiences more than those of Libyan stakeholders and local vulnerable groups. The intention-implementation gap of EU crisis response in Libya has high reputational costs, which in turn may bear political consequences against political reconciliation in the longer run.